We present to you a special post by Laxmi Hariharan where she speaks about her Role Model. Get inspired as she is judging the ‘My Role Model‘ activity with Kiran Manral. Hating the job that chained one to a desk. The conflict in so many of them was palpable. All through my teens it was the disturbance under the surface, of the grown ups I met that affected me the most. The only people who seemed at happy—or rather I would say those who seemed to be at peace with themselves were they who had made more momentous decisions in life. Choices one would not always call conventional. Following one’s more artistic instinct to pursue careers which didn’t always pay well, but which seemed to fill an empty space inside. Then I read a line, which gave me hope. “I am in a hurry to grow up,” remarked the teenaged Bruce Wayne to Alfred after his parents have been murdered. I didn’t know then that I would spend the rest of my life trying to live that statement. Bruce makes it his life’s mission to avenge their death, to wipe out evil so no other child has to go through what he has: seeing one’s loved ones murdered in front of their eyes. And so he sets out to study hard, work out hard; build himself in body and mind. Yet, after he eradicates the man who has killed his parents, he is rudderless, for he no longer has a goal, and so he embarks on a walkabout to find inner meaning, true purpose to his life. I couldn’t escape the fact that his parent’s murder had given Bruce a clear goal in life. One, which cut through everything else, that put him on the path to becoming Batman. The seductiveness of purpose is hard to resist. It’s a siren call, which one can spend one’s life in pursuit of answering. It orients a rudderless life. For me, it was a beacon of hope that I clung to in between the bewilderment of trying to become an adult. I knew my inner Batman lay in using the power of the written word, but unlike Bruce, there was no one single inciting incident in my own life, that set me on my chosen path. No, I lie, there was an incident; but unlike Bruce it happened much later in life. A death, which showed how short and precious life, could be. I call it my near life incident. For in death I found life and realized once more my real purpose. My advantage over Batman was that I could reinvent myself many times. Live many roles, in the same lifetime. Those series of vignettes of a boy in a hurry to become a man with a purpose stayed with me through the different countries I lived, the different roles I played before embracing the path that chose me. You could call it my red thread, the strand around which I build the DNA of my life. It was this instinct, which stayed with me: Even as I played at being someone who wanted to climb the corporate ladder, someone who wanted to make enough money to buy the comforts in life, yet underneath it all I remained that girl in a hurry to grow up. The one who would forever look for the courage of conviction to follow the path that had chosen me? As a child it is simple. You know what you like to do. Why not do it? Then as you grow older the practicalities of life, of conforming to societal traditions take over. We end up replicating the lives of our parents in many ways, without even being aware of it. However if you know your red thread, your purpose, then you too could be a Batman, a role model. Strive to grow up, orient yourself towards the goal at the end of that red thread, stay inspired and true to your calling. 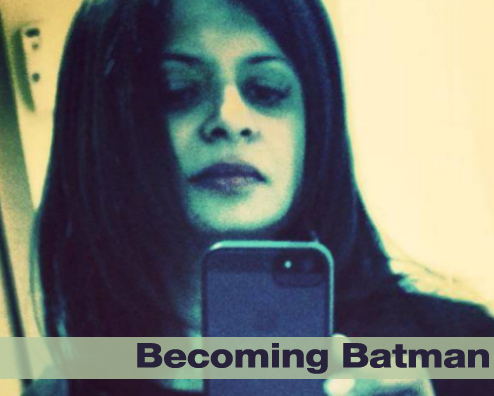 I am still trying to grow up, but hopefully have taken a few concrete steps towards becoming the Batman of my life, including writing The Many Lives of Ruby Iyer, out later this year. How about you? Have you found your inner Batman yet? Laxmi Hariharan is the kindle bestselling author of Bombay Chronicles and of Ruby Iyer, out in November. Her blog was ranked among the top five personal blogs in India. Find her on Facebook or Twitter. If you have not yet participated in this awesome activity, then do it now. Talk about your Batman, your role model and get read by Laxmi and Kiran, apart from winning amazing prizes. Laxmi is a fun loving, witty and feisty writer. I have been following her blog from quite some time now and I am really happy that she is here on Blog Adda as well. I love all the references to Batman and how she has interconnected him to her personal life. Wonderful read.